Tired of wearing the same old jewellery? Wondering what’s the latest fad this wedding season? Well, its the Pom-Pom accessories. They are everywhere. Be it the wedding decor, or on brides mehendi outfits and even in some cases home decor. There is just no ignoring this trend. Summer is upon us, and if there is anything that makes it cooler, its wearing some colourful outfits and dressing up in gorgeous Pom-Pom accessories. Off late, a lot of you have been asking where to buy affordable colourful jewellery and so I decided to team up with Urban Gota. 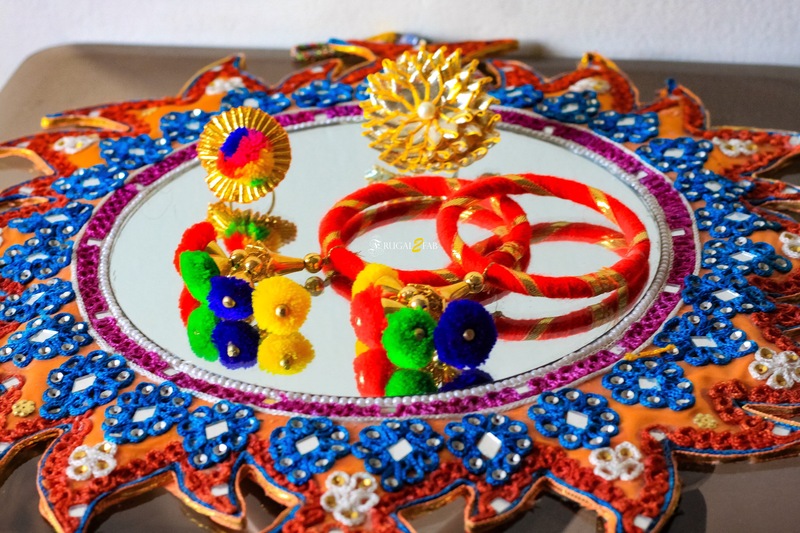 They are a mother daughter duo who specialise in making pom-pom and gota-patti accessories. You can pretty much wear these accessories with both indo or western outfits. Its all about how you style them. I decided to go for a full on colour pop spree with a beautiful banarasi outfit that my mum in-law had gifted me during my wedding. It was originally supposed to be a suit set, but I decided to tweak it a bit and make it into a kurti lehenga. Let me know what you think about it. Their gota rings are fun, colourful and 100 % handmade. They are the most practical, fuss free favours to give out to guests. Bangles have size issues, earrings are something guests wear and arrive to the function according to their ensemble (as a part of their wedding outfit). Maang tikkas can be tricky to wear but rings can be slipped on easily. They also have beautiful silver gota rings in pom-poms which you all must check out. How to buy these accessories? You can reach out to Urban Gota through their social media. What all can you find with Urban Gota? Urban gota is infatuated with Gota and pom-poms. They make favours and accessories that are kitschy and completely desi. Their signature product (main focus) is gota rings that can be given away during mehendi / haldi ceremonies. They also do shagun envelopes with gota motifs. Additionally, they are also planning to do earrings, rakhis and other knick-knacks with gota flowers. How much do these Pom-Pom accessories cost?